Facebook’s $19 billion acquisition of WhatsApp has woken many in the West to companies that are building their business in global markets, and browser-maker UCWeb is another that has flown under the radar so far. UC Browser is strongest in China and India,where it claims dominant market share of 65 percent and 32 percent respectively, but it also says it has seen strong growth in Russia, Vietnam, Indonesia and — interestingly — the US. The 9-year old company claims its app has at least 10 percent market share in 10 countries worldwide. You’ll note that the figures in some of these markets are percentage increases rather than raw market stats, growth is easier when you have a smaller base of users, so UC Web isn’t (yet?) a major player in some of these markets. Nonetheless, UCWeb seems to be growing at impressive speed. It reached 400 million registered users back in December 2012, so that’s 100 million new additions in just over a year, during which time it has made a big push for the US market. 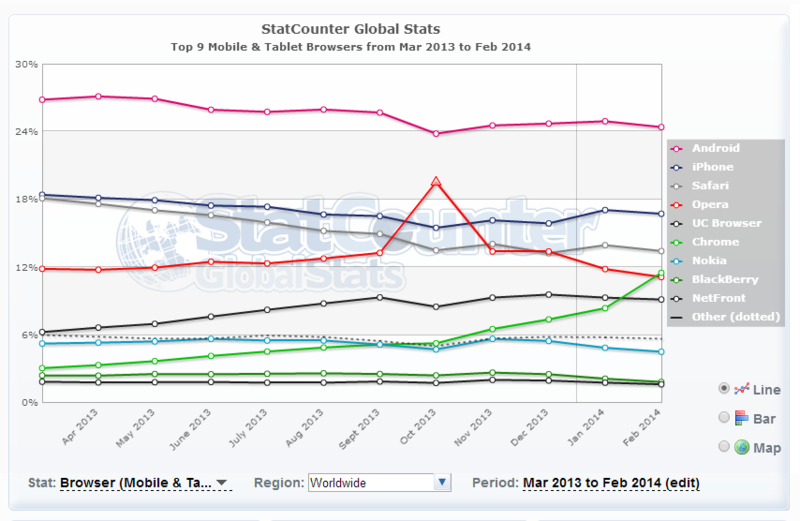 So why is UC Browser proving to be so popular? The company counts Alibaba — the e-commerce firm that just invested $215 million investment in messaging app Tango — among its investors and Alibaba founder Jack Ma — an iconic figure in China’s tech industry — sits on its board. Alibaba is believed to have invested in the company twice, but the exact size of its investment and stake has never been quantified. Beyond stellar contacts, UCWeb has a strong localization policy for each new market expansion. As Pando Daily pointed out last year, that means local offices, local teams and local content partnerships in each market: in India, for example, it has plans to employ over 100 Indian nationals. The product itself is perhaps comparable to Opera, another browser-make that adopts an emerging market focus. UC Browser uses data compression technology to minimize the cost of browsing and downloading — which is particularly important in Asia, where the overwhelmingly majority of mobile Internet users are on pre-pay deals — while an interesting HTML5-based Web store is attached to its browser. In the same way that messaging app Kik is exploring the mobile Web opportunity, UCWeb has embraced it too. Developers can build Web apps that UC Browser users install and use right from their mobile device. UCWeb says it is currently working with 5,000 partners, which include service providers, developers, gaming firms and e-commerce merchants. In India, for example, it has ‘add-ons’ to help users keep up with cricket scores and recently launched train inquiry service that shows travel times and ticket information. As part of its crossing of half a billion users, the company is upping its focus on the content side of its offering. “Our new mission is to provide users with more than just a browsing tool, but also a platform of rich content and services specially developed for users in different regions,” it says in a statement. The company recently branched out into smart TVs with a dedicated new browser and it has continually expressed an interest in relocating to the US, it currently has a small office in California. There has even been talk of a US-based IPO — something which might be more realistic if Sina Weibo and Alibaba‘s Stateside listings go well and there is momentum for Chinese firms to latch on to.